NAMED ONE OF THE BEST BOOKS OF THE YEAR BY "SLATE"
In her first novel, Lauren Owen has created a fantastical world that is both beguiling and terrifying. 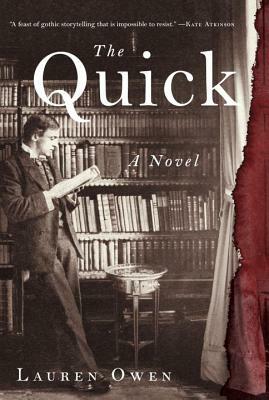 "The Quick" will establish her as one of fiction's most dazzling talents. "A suspenseful, gloriously atmospheric first novel, and a feast of gothic storytelling that is impossible to resist." --Kate Atkinson"
"A cracking good read . . . Owen takes the gothic conventions of the vampire novel in a refreshing new direction." --Deborah Harkness, author of "A Discovery of Witches" and "The Book of Life"
""The Quick" is that rare book that reviewers and readers live for: both plot- and character-driven, a stay-up-all-night reading romp. . . . This is elegant, witty, force-of-nature writing."" --The Dallas Morning News"
"The book's energy, its wide reach and rich detail make it a confident example of the 'unputdownable' novel."" --The Economist"
"A seamless blend of Victorian London and rich imagination." --Tana French, author of "In the Woods"
"A thrilling tale . . . This book will give you chills even on a hot day."" --"Minneapolis" Star Tribune"
"Stylishly sinister . . . will have you sleeping with the lights on."" --O: The Oprah Magazine"
"A sly and glittering addition to the literature of the macabre." --Hilary Mantel, author of "Wolf Hall"
"A big, sly bucketful of the most tremendous fun . . . Owen] weaves what's here with what's beyond as easily as J. K. Rowling does." --"Slate"
" An author of] prodigious gifts . . . Owen captures Dickens's London with glee and produces a number of characters Dickens would be happy to call his own."" --Pittsburgh Post-Gazette. Lauren Owen was born in 1985. She studied at Oxford University and the University of East Anglia, where she received the 2009 Curtis Brown Prize for the best fiction dissertation. "The Quick" is her first novel. She lives in Northern England.